Matthias Withoos (Amersfoort, 1627 – Hoorn, 1703): Vanity of Vanities. A lot of his paintings have a vanitas motif. Vanitas is the Latin word for ‘emptiness’. It corresponds to the meaninglessness of earthly life. 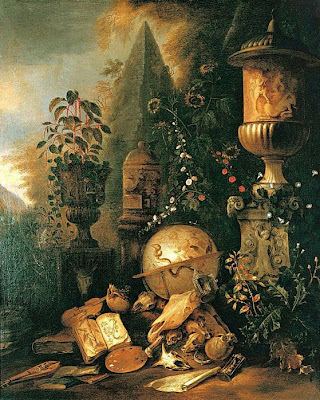 Common symbolic motives in vanitas paintings are among others skulls and flowers; they show the passage of time. Copper scorpion - Found in an Arizona mine; photographed at the Tucson Gem and Mineral Show. Photo cropped for size from the original.